Have I mentioned that we have blueberry bushes? Well, we have three. I bought them last year (as in 2010) on clearance at Walmart. They didn’t really do much last year, in fact, I wasn’t sure if one was going to make it. But it did. This year they had beautiful white blooms on them. And we harvested the berries in July right after Christian and Josiah went to Philmont. What? 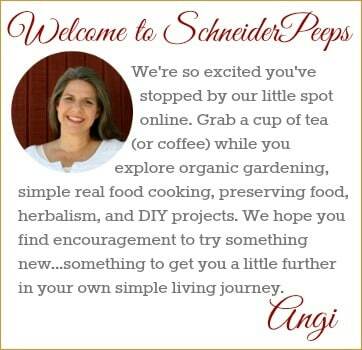 You don’t remember the great blueberry harvest post? That would be because only one plant actually produced blueberries this year and it only produced four. But I have it on good authority that those four berries were deeeelicious. This is our “producing” bush in March. This is the same bush now. As you can see there is a lot of new growth. 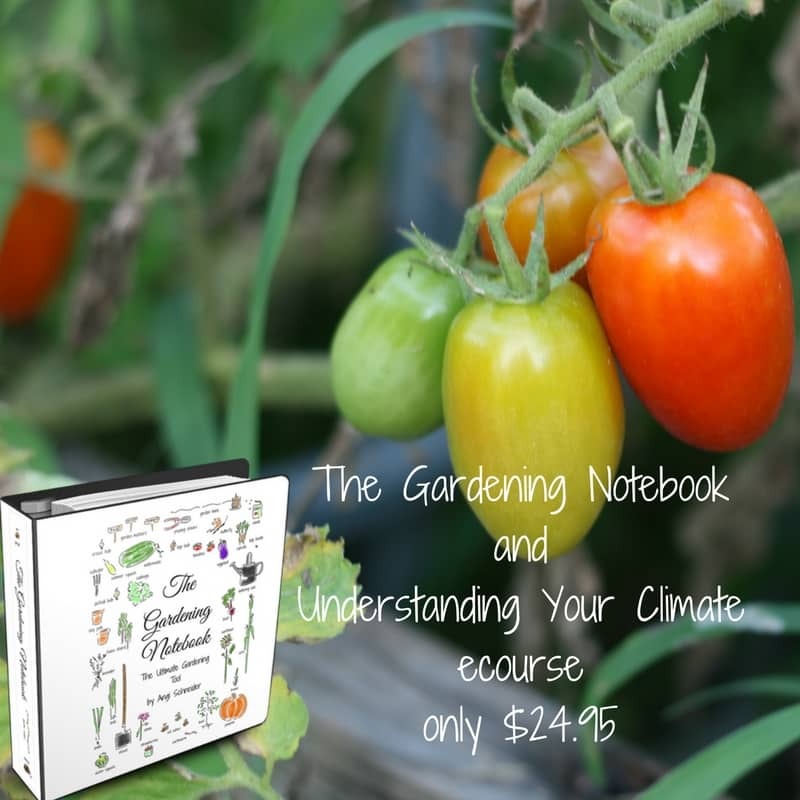 So far my two favorite books on growing fruit are Grow Fruit and Eat Your Yard: Edible Trees, Shrubs, Vines, Herbs, and Flowers For Your Landscape. I knew I wanted plant them in containers since they need really acidic soil and we because we are renting right now. After looking at all the different containers, we decided on a “homemade” one. Carl took two 55 gallon plastic drums and cut them in half. We (as in my boys) drilled holes in in the bottom of each one for drainage. We (as in I) spray painted them and then filled them with peat not soil. Blueberries like acidic soil. So if your soil is not acidic it might be easier to grow them in pots with peat instead of trying to adjust your soil. Blueberries are partially self fertile, meaning that they can set fruit with their own pollen and you only need one plant. BUT, they will do better if you have 2 or 3 varieties (not plants but varieties) so that they can cross pollinate. Blueberries like to be watered often – I’ve struggled with this the last few weeks and some of our leaves have burned up. After the fruit begins to ripen you might need to cover the bush with a net to keep the birds away. Harvest when the berries have turned blue and also have a milky color on them. 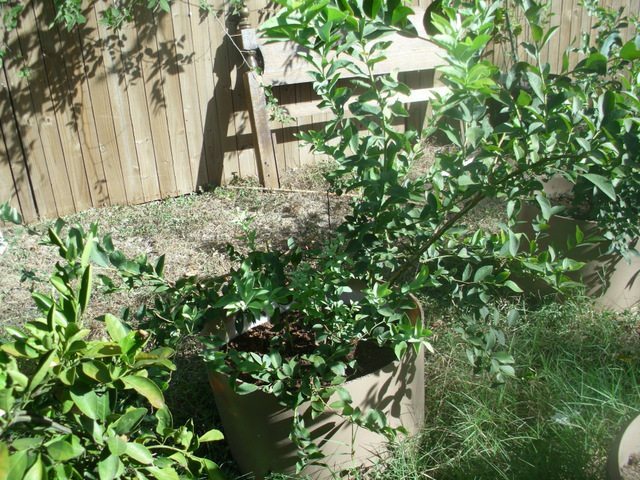 Yields: About 3-5.5 pound of fruit per bush by the time it is 4 years old and up to 11 pounds for a mature bush. Right now, we only have one variety. I have a friend who has a different variety and there’s a bush at our church’s office. I’m planning on taking cuttings during the next few weeks and starting some of these other varieties. Hopefully, they will take and we’ll have a few more than four deeeelicious blueberries next year. 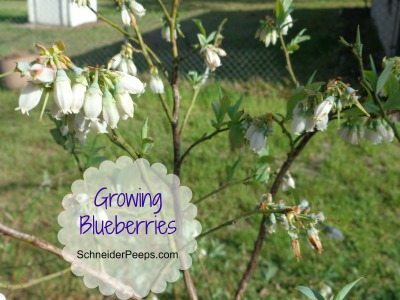 If you have any other tips for growing blueberries, please leave them in the comments. To see other great gardens, check out Tuesday Garden Party and Barn Hop. 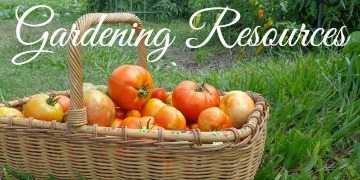 You can find information about other fruits and veggies by searching clicking on the In The Garden tab up top or in The Gardening Notebook. Oh, I love blueberries. They have got to be one of my favorite fruits. So, I hear about soil acidity a lot. How do you measure whether your soil is acidic or basic? Did I ask that right? Get some soil. Divide it into two parts in different containers. Add vinegar to one container. Dilute baking soda with distilled water and add it to the other. Depending on which container bubbles will tell you which type of soil you have. Rachel: There are soil test kits you can get to test the soil. Blueberries like a ph of about 4.o-5.5. We’ve never tested our soil, but I know that blueberries don’t naturally grow down here so I thought a container would be easier. Plus we can take it when we move. 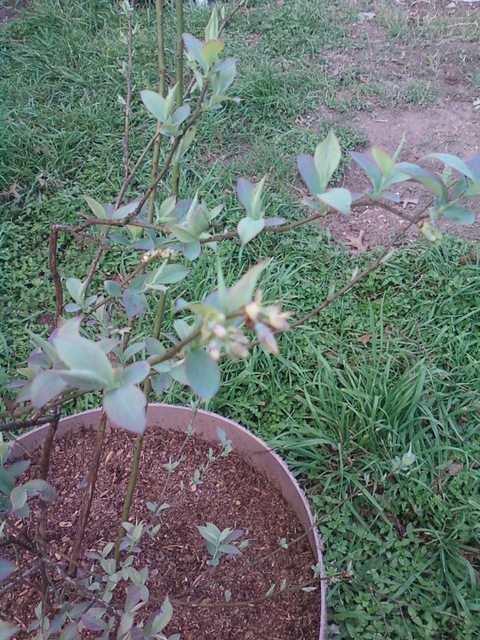 I have 6 blueberry bushes as of last year. I have 2 – first year, 2 – second year and 2 – three year. I put pine needles on them last year before winter and mixed that in the soil. I put some kind of meal on them – blood meal I think. They produced but it wasn’t much so I’m hoping next year is better! We have 300 blueberries. And have found cuttings take really easily. If any branches snap I just shove then in the ground and, as long as they don’t dry out, away they go. We do have acidic soil tho. Anna, that’s good to know. I can’t imagine 300 blueberries, that’s amazing.